For reasons which should be obvious to most, the “Great and Holy Council,” which is currently underway in Crete, has been on my mind quite a bit. Last Friday, over at First Things, I gave a sobering account of where matters stood on the eve of the Council without wishing to get bogged down with predictions (most of which probably wouldn’t come to pass anyway). On Sunday, Pope Francis sent out the following tweet. Let us join in prayer with our Orthodox brothers and sisters for the Holy and Great Council of the Orthodox Church opening today in Crete. No doubt the Holy Father meant well, but Catholics should not forget the extent to which anti-Catholic animus coupled with ecclesiastical chauvinism have conspired to derail the Council. Now with word getting out that the Council is considering a draft document which would, in effect, “elevate” four Orthodox councils/synods to “ecumenical” status, a new line is being drawn in the sand between East and West — and to what end? The Orthodox world is splintering in profound ways along national and ethnic lines. Some are even predicting an eventual schism between the Ecumenical and Moscow patriarchates. How does it make sense, at this late stage in the game, to go beating the anti-Scholastic/anti-Papal war drums? Or perhaps this is a necessary growing pain which both Catholics and Orthodox must endure on the fraught path to unity. Now may be a good time to wonder if the oft-derided project of “Uniatism” isn’t the way to proceed, at least with respect to those parts of the Eastern Orthodox Church who are willing to prioritize both unity and truth without fictitiously shrinking the Body of Christ down to a ghetto. In closing, let me call your attention to a quote by the Russian philosopher Vladimir Solovyov which Pater Edmind Waldstein recently posted up on his web-log, Sancrucensis. Maybe this says it all? Otherwise, if apart from Peter the universal Church can expressly declare the truth, how are we to explain the remarkable silence of the Eastern episcopate (notwithstanding that they have kept the apostolic succession) since their separation from the Chair of St. Peter? Can it be merely an accident? An accident lasting for a thousand years! To those anti-Catholics who will not see that their particularism cuts them off from the life of the universal Church, we have only one suggestion to make: Let them summon, without the concurrence of the successor of St. Peter, a council which they themselves can recognize as œcumenical! Then only will there be an opportunity of discovering whether they are right. Rorate Caeli ran an odd post (for a traditionalist website) on Saturday decrying “false collegiality.” Why? Because the Holy See is now demanding that it must be consulted in advance of bishops establishing new institutes of consecrated life with their respective dioceses. While this move—which could have negative consequences for conservative and traditional institutes—does indeed appear to be a slap in the face to the idea of collegiality in the Church, since when have traditional Latin Catholics cared about such a thing? For nearly fifty years traditionalists have been attacking the very idea of collegiality since the promulgation of Lumen Gentium at the Second Vatican Council. Generally stated, traditionalists worry that collegiality undermines the authority of the pope by disrupting its inherent monarchical structure (assuming the Church has ever truly had such a structure as many traditionalists conceive of it today). Even during the days of John Paul II and Benedict XVI, when my traditionalists felt alienated from the Church and unhappy with various decrees emanating from the Vatican, they continued to call for an end to collegiality, or at least a reformulation of the concept along papal-monarchical lines. So what has changed? Has Francis’s pontificate become so nauseating to their ecclesiastical tastes that they are now willing to flip on collegiality, desiring for its full return rather than suffer from the apparent horrors of centralization? Granted, there is plenty of room offered up by this recent move concerning institutes of consecrated life to wonder about the intentions and motives of Pope Francis. Francis, who has never been shy about speaking on the need for great collegiality and doctrinal decentralization in the Church, doesn’t seem to be following his own mind, at least not on this matter. Moreover, there have been plenty of points during Francis’s pontificate where it appears that he wants his own personal form of piety and idiosyncratic understandings of Catholic teaching to become normative for the universal Church without regard to the Church’s rich history of diversity. And he has certainly had no problem preempting the heads of particular churches in dealing with non-Catholic Christians, such as failing to invite Patriarch Sviatoslav of the Ukrainian Greek Catholic Church (or any official UGCC representatives) to his historic meeting with Moscow Patriarch Kirill. Furthermore, neoconservatives’ very love for the Church and strong emotional attachment to the Magisterium cause them to find it unimaginable that the Church could ever falter, even with regard to matters of discipline. Like the father who loves his daughter and therefore has a hard time imagining her doing anything wrong, neoconservatives have a hard time conceiving that the Holy Ghost does not guarantee infallibility in matters of discipline or non-infallible ordinary magisterial teaching. Traditionalists, confronted by a Church in crisis, know that something has gone wrong somewhere. As a result, they are, I believe, more sober in assessing whether or not the Church exercises infallibility in a given case. That, allied to their looking at the present through the eyes of the past, helps traditionalists to see that the onus is on the present, not the past, to justify itself. The only quibble I have with Fr. Ripperger’s piece — and it is a minor one — is that it doesn’t account for the experiences of Eastern Catholics, most of whom do not fit neatly into either the traditionalist or conservative category. While there is what I would call a “natural conservatism” among the Eastern churches, centuries of living in a de facto ecclesiastical ghetto coupled with various influxes of “Latinization” have compelled contemporary Easterners to recover their respective traditions. This is all fine and good, but as most Latins know by now, the process of “recovery” is often fraught with difficulties and subject to being hijacked by renovationists. By now everyone and their sister, Catholic and non-Catholic alike, has had a chance to weigh-in on Amoris Laetitia (AL), Pope Francis the Merciful’s ponderous exhortation which may, or may not, have altered Church teaching on marriage forever; reaffirmed traditional Catholic doctrine with beauty and profundity; or accomplished nothing at all. Where one comes down on those options (or a plethora of others which lie somewhere between them) probably says a lot more about their religious orientation than anything else. For what it’s worth, I’m leaning toward “accomplished nothing at all,” not because I believe everything is hunky-dory in the Church (no, no, no, not that) but because Catholic doctrine on marriage, the family, and sexuality has been a mess for more than half-a-century already; AL doesn’t add to it in any significant way. What it does do, however, is bring out into the open what all of those with eyes to see already knew, namely that “individual conscience” rather than the Gospel shapes the decisions of millions of Catholics regarding remarriage, contraception, and the moral status of any number of sexual practices and proclivities. Those who already cut conservative-to-traditional, for the most part, still affirm traditional doctrine in these areas; nothing in AL will now prompt them to start divorcing en masse or approaching the sacraments unworthily. Catholics on the other end of the ideological spectrum will keep doing what they’ve always been doing, though perhaps they’ll be a tad bit bolder about it. No one, however, should even attempt to claim that AL did a single thing to relieve the great moral and doctrinal crisis afflicting the Corpus Mysticum. That’s just a bridge too far. I see no reason to comment in-depth on AL or, for that matter, much of anything else the Holy Father in Rome has to say. When it comes specifically to the issue of marriage, his credibility was shot the second he imprudently reformed the annulment process last year. At that moment “Catholic divorce” became a sure-fire reality and all claims that the Catholic Church’s approach to broken marriages differed substantially from the Orthodox approach were rendered implausible. In fact, given the nature of Francis’s annulment reforms and the easy-going manner in which many annulments can now be attained, there is a powerful argument to be made that the Orthodox (at least in the Russian tradition) have a much more demanding process in place for marriage dissolutions. Does that make the Orthodox approach “right”? Probably not, though they deserve credit for being honest about what they are doing even if it emerged as something of a late-Byzantine historical accident. 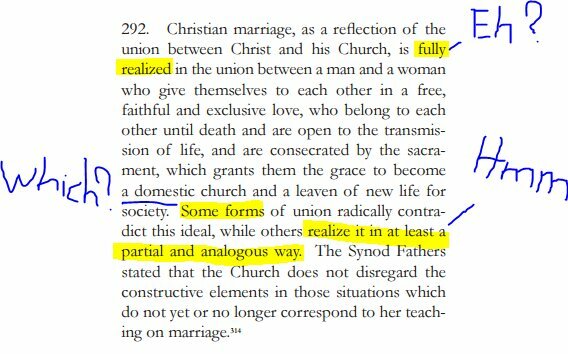 And while nobody wants to mutter this too loudly, let’s not forget that until the late 19th/early 20th Century, a number of Greek Catholic churches followed Ortho-praxis regarding second and third marriages. If Rome is serious about the Eastern Catholics reclaiming their authentic traditions, shouldn’t that be back on the table, too? With all that said, let me close by promising that I will never speak of AL on Opus Publicum ever again. I do reserve the right to make mention of it in other forums, however, should the need arise. I will leave it to those far more invested in apologizing for/damning Francis, the post-Vatican II magisterium, and the deplorable leadership in the Latin Church to unpack this-or-that murky passage in AL or project what some footnote could mean for the future of Holy Mother Church. I have popcorn to make. Elliot Milco, who went from humbly editing The Josias to serving as an editorial assistant at First Things, has a new article available online entitled “The Future of American Catholicism.” (I won’t excerpt it here; you should read the whole thing.) At the heart of Milco’s piece is an analysis of how the rickety pact between (classical?) liberalism and Catholicism in America spilled over into the teachings of the Second Vatican Council and has now become something of an embarrassment for contemporary American Catholics who now realize that promise of liberalism is (and perhaps always was) empty. Tied to this analysis is a sobering reminder from Milco that even when Catholics choose to engage political liberalism in the so-called “public square,” they typically do so in expressly secular terms, pointing to vacuous concepts like “religious liberty” to defend themselves from the Obama Administration’s contraception mandate rather than invoking the Gospel (or, for that matter, natural law). American Catholics, like most American Christians, live their lives as if Christ never came at all, and perish the thought that He will ever be coming back.